Breakfast, lunch and dinner in all 11 restaurants, including 2 buffet restaurants, a snack bar that's open 24 hours a day, and 6 a-la-carte restaurants: México Lindo (Mexican), Kyoto (Japanese), La Fuente (Spanish), La Dolce Vita (Italian), Steak House (meat) and El Coral (fish and seafood). All the a-la-carte restaurants require prior reservation and have a dress code. La Comedie restaurant is included in the All Inclusive package for Club Premium guests; there is an additional charge for regular guests. 13 bars, including a sports bar open 24 hours a day, nightclub and pool bars with unlimited local drinks, and a selection of international drinks. Alcoholic drinks may only be consumed by over 18s. 4 swimming pools, including children's pools, adult pools and a semi-Olympic swimming pool. Nightclub with drinks included from 23.00 to 03.00 for over 18s. From Saturday 21 December 2019 until Sunday 5 January 2020: Enjoy 45 % off! From Tuesday 23 April 2019 until Tuesday 30 April 2019: Enjoy 55 % off! From Tuesday 28 May 2019 until Friday 31 May 2019: Enjoy 40 % off! From Saturday 1 June 2019 until Friday 14 June 2019: Enjoy 40 % off! From Saturday 15 June 2019 until Sunday 30 June 2019: Enjoy 48 % off! From Friday 1 November 2019 until Friday 20 December 2019: Enjoy 50 % off! From Monday 1 July 2019 until Saturday 17 August 2019: Enjoy 45 % off! From Sunday 18 August 2019 until Thursday 31 October 2019: Enjoy 42 % off! From Friday 24 May 2019 until Monday 27 May 2019: Enjoy 40 % off! From Wednesday 1 May 2019 until Thursday 23 May 2019: Enjoy 45 % off! The Barceló Bávaro Beach is an adults-only hotel. 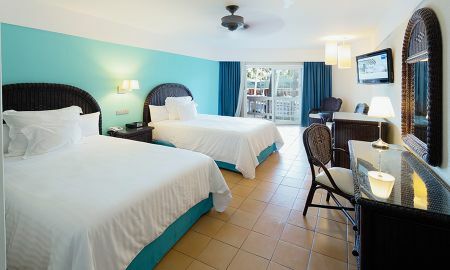 Most of its rooms are situated on the beach. It is the ideal accommodation for romantic getaways. Barceló Bávaro Beach boasts a wide gastronomic offer thanks to Barceló All Inclusive Program. Choose and enjoy the Buffet Caribe, Chez Gourmet, La Brisa, Chez Gourmet (International), La Brisa (Mediterranean cooking), El Coral (seafood), Santa Fe (meat), La Dolce Vita (Italian), Mexico Lindo (Mexican), La Fuente (Spanish), Kyoto (Japan) and La Comedie restaurants (Gourmet restaurant available with an additional charge, except for Club Premium clients). Barceló Bávaro Beach has all the necessary facilities for entertainment such as football pitch, tennis court, swimming pool, golf course, water sports, wellness centre, theatre and casino. Guests will be welcomed with a cocktail when entering the hotel for the first time. 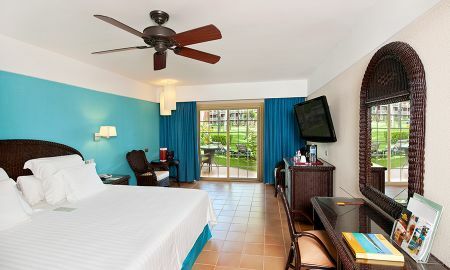 Moreover, by staying at Barceló Bávaro Beach you can also access the facilities and services of Barceló Bávaro Palace Deluxe. The Barcelo Bavaró Beach Hotel - Adults Only is located in one of the 10 best beaches in the world: Bavaro Beach, in the Eastern region of the Dominican Republic.